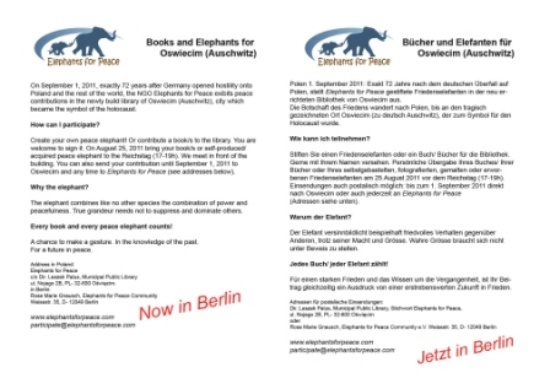 The elephants will be carrying books to the new library, books donated by supporters – schoolchildren or just friends of the cause. What a lovely idea. The next station will be Nuremberg and another project in the near future is Israel. May the elephants bring peace to our world! On the photo: in front of the library building is the Mayor of Auschwitz, Mr Marszalek and staff, the Director of the library and the Vice President of the Elephants for Peace Community e.V. Mrs Andrea Horstmann-Osterloh with the Peace Elephants from Cyprus and Schengen arriving first.